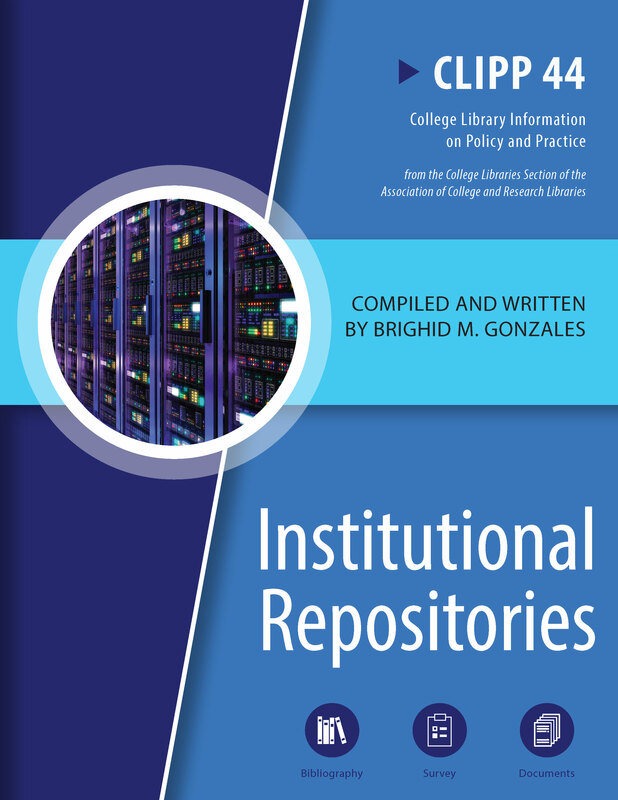 CHICAGO – The Association of College and Research Libraries (ACRL) announces the publication of “Institutional Repositories,” compiled and edited by Brighid M. Gonzales, book number 44 in ACRL’s CLIPP series (formerly called “CLIP Notes”). This book focuses exclusively on institutional repositories at colleges and small universities by collecting relevant survey data about the planning, funding, staffing, and implementation of repositories at these institutions, as well as documentation on best practices, policies, guidelines, and other information germane to the deployment of an institutional repository in an environment focused primarily on teaching. The College Library Information on Policy and Practice (CLIPP) publishing program, under the auspices of the College Libraries Section of ACRL, provides college and small university libraries analysis and examples of library practices and procedures. In six sections — Introduction, Literature Review and Bibliography, Analysis and Discussion of Survey Results, CLIPP Survey with Results, Additional Resources, and Sample Documents — "Institutional Repositories" collects some of the techniques and solutions unique to their size that colleges and small universities have found, including shifting the focus of collection to student research, joining other schools in consortiums to offset costs, creative combinations for staffing, and creating new methods for increasing faculty participation. Where the repositories of research universities tend to focus on the work of faculty and researchers within the institution’s community and provide access to their accumulated preprints, post-prints, datasets, and other research output, the repositories at smaller institutions often feature student theses and dissertations, honors papers and capstone projects, courseware and other teaching materials, student and faculty published journals, archival materials, and other content that better reflects the teaching and student-focused missions common at smaller schools. For more information on the CLIPP publishing program or to submit a proposal for a new CLIPP, please visit the ACRL website. “Institutional Repositories” is available for purchase in print and as ebook through the ALA Online Store and by telephone order at (866) 746-7252 in the U.S. or (770) 442-8633 for international customers.